Discussion in 'XPO Logistics' started by mrpkgman, Aug 15, 2018. I hear there's some new rules that go along with it. I’m quite content with 65. ROUGHBOY and highspeeds like this. 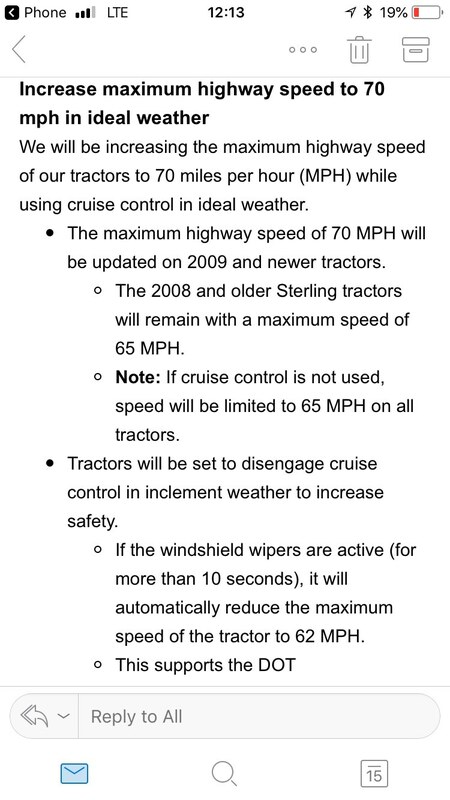 According to this , you will be back to 62mph if you turn your wipers on. highspeeds and smokin'joe like this. If the speed limit is 65mph people generally do 5 - 10 miles over the limit. If it's 70mph , same thing. By tacking on 5mph more it helps shrink the difference in the speed of traffic on the highway. It can be crazy to see people hurtling up to the back of your trailer , only to have to suddenly try to slow down. Some misjudge just how slow XPO vehicles are moving. Hopefully , this helps , if only a little bit. ScotchNeat, upnorth and sucker666 like this. WiggleWagondrvr, Clandestine_ice, Frootloop and 5 others like this. sportsman800, highspeeds and sucker666 like this. WiggleWagondrvr, lhdrvr, Frootloop and 8 others like this. I have no problem with this. Actually a common sense move. WiggleWagondrvr, ScotchNeat, rowdydog and 3 others like this. Using DriveCam, we will work to proactively coach on over-speed and too fast for conditions to help prevent accidents and injuries. Two new behaviors, “Speeding” and “Cornering Speed” will be added to our DriveCam suite of measurements. A Speeding event will trigger when a driver travels 10 MPH or more over the posted speed limit. A Cornering Speed event will trigger when a driver begins a 90-degree turn at 15 MPH or more. These events will be coachable and will be used to help reduce the risk of accidents when traveling above the posted speed. Here in the NE I would rather have a truck that will pull a hill then do 70mph. I'll take a 65mph truck that will pull a hill at 55 and one down shift then a 70mph truck that has to drop 3 gears to pull the same hill. Ump, ScotchNeat, doubledonger and 5 others like this. I talked to a mechanic at my shop this morning. The update will be done at PM’s. Along with the new top speed, there will be “more power” in the top two gears. I don’t know how much, but this might help pull the hills. Personally, I hate using cruise. I think the tractor holds its speed better with the pedal mashed. I think some drivers will get into trouble when doing 70 in a 55, like on route 95 or 84 in Connecticut. Time will tell. highspeeds, ROUGHBOY and Bloodwidow like this. dalesr, The magician, icuicp and 1 other person like this. Push your luck and you live with the consequences. Looking forward to hearing about more power for hills. That would make our longest run much more enjoyable. Not to mention a shorter drive line. Which even with the 70 mph truck, getting a little more drive time on top of that, is going to be a plus. dalesr and icuicp like this. We have been hiring anything with a CDL. The results of that show up everywhere. Used to be we feared losing money out of our paychecks to dock hands. Now we wonder how much longer the company can afford to have drivers work the dock. Some disastrous loads. And then, yeah, they probably weren't to concerned about how they pulled them home either. I wonder how long before the 4 wheels start using cameras and some of that horse play gets some people fired. Passing on the shoulder, and even worse if it was a pedestrian vehicle. This wasn't just drivers going three wide on a two lane highway. Probably with CBs or cell phone to communicate. Not that it would make this any better. It was a third party. Already moving slow. Getting passed on both sides by sets. Had to have been scared out of their minds. Think if it was your mom or your wife or your kid driving that slow roller. To be put in that position. ROUGHBOY, troubleman84, Fly-by-night and 2 others like this. Oh yeah. We have some real winners driving sets. Since there are virtually no hills on that stretch of road, you need to be a professional driver and back out of the throttle to let these guys go. If not, you see crap like you did, usually with a line of trucks waiting to get by. As far as the cross Bronx, if you stay in the middle lane, it isn’t too bad (as I’m sure you know). But that left lane, no thanks. New York and Connecticut roads are awful, but I’m sure there are worse. totally backwards,makes ZERO SENSE,if i'm passing someone I want control of throttle,not on CC,say you're using "cc"come up on traffic,be nice to foot the peddle to pass,65 is fine if they up the torque,why do they NEVER ask the drivers?????? waffle man, dalesr, highspeeds and 1 other person like this.